When we bought our farm, we wanted to raise our own food. I grew a large garden and we had chickens. Then, we decided that we wanted to get a goat doe for milking, We researched our options and decided that we didn't want to get a pregnant doe that had not been tried because we were knew that we were too inexperienced. We wanted to spread out having to learn new aspects concerning goats over a longer period. I decided that I wanted to learn to milk a goat that knew what she was doing, and we didn't want to have to worry about birthing kids right away or making sure that they were nursing properly. We studied what we could about goats from the internet and learned that it wasn't a good idea to get a single adult doe for milking because she was likely to be lonely and run off to look for companionship if we humans ever decided to leave the farm for even a few hours. We however, looked at our finances and concluded that there was no way we could afford to pay for two adult goats at one time. In addition, there was the fact that if we wanted to continue milking goats, we would need to find a buck for her to breed at the end of the season.Keeping a smelly old adult goat to service two does was also not an option. I determined that there had to be a way to take care of both of these problems without breaking our budget. Like so many ideas, the solution to our dilemma came to me while I was washing dishes. I came up with the idea that I would buy one adult doe and then give her two unrelated, weaned kids for companionship for the milking doe. We would get another doe kid to become another milker the following year, and we would get a billy kid to breed with both of them in the fall. After breeding the young buck to both does, we would sell the young buck. That way we would not need the expense or the smell of keeping a buck over the winter. Have you ever thought about raising goats? Yes, but I am not in the right situation right now to have them. Yes, I used to raise them, but now I don't. Yes, I raise them now! Yes, I will be raising them in the near future. In one of the local papers I found an ad from a farm that was selling a number of goats. When I called the number in the ad, I learned that they were trying to reduce their herd of about 300 goats. I threw a couple of ropes into the back of my Subaru and went to check out what goats they had. I drove to the farm which was located about fifty miles from where we lived. When I arrived I marveled at the size of the operation. I was greeted by a woman who then showed me what goats she had for sale. 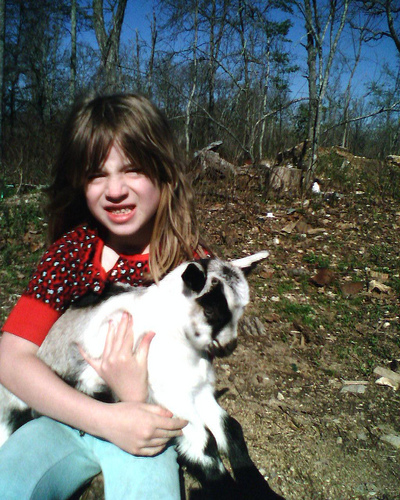 The first goat that I met was Minion. Minion was an odd looking old goat. She had her horns removed when she was young, but one of them grew back. The horn was gnarled and she she sort of looked like a unicorn with the horn in the wrong place. She would not have been the goat I would have chosen except for the fact that she followed us everywhere we went around the farm and demanded my attention. She quickly grew on me. She may have been funny looking, but she certainly was friendly. Friendliness was definitely a trait I wanted in a goat. She was also for sale at a reduced cost.She was healthy at the time that I got her, but what I didn't know was that she was one of those goats that usually got mastitis every year and had to be treated with antibiotics after kidding. I wouldn't learn that until the next spring. The female kid that I got had been weaned within the past week. The billy was in a pen with other young billies and would have been sent to the sale barn. I got all three goats for a lot less than I would have gotten two good milking does. My first problem concerning the three goat was how I was going to get them home. I had brought two ropes with me and because she had a collar, I decided to put Minion in the back and tie her using both ropes so that she couldn't jump out of the back of the vehicle. But what was I do do with the kids? The kids didn't have collars so I had to make a decision about what to do with them. I decided to lay a blanket across the back seat and put them both back there for the trip home. Fortunately it worked. The goats made it home without any major difficulties. 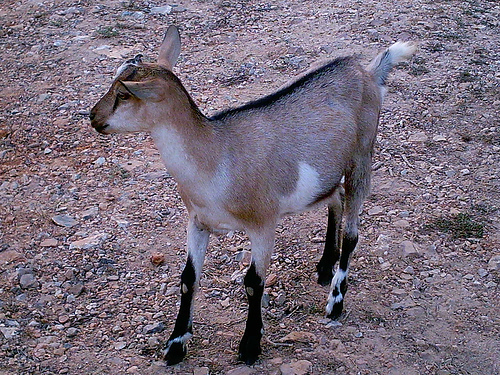 There are many positive qualities that you should recognize when looking for a good dairy goat. Knowing these qualities will give you lots of milk, many goat kids, and a goat that lives a long productive life. 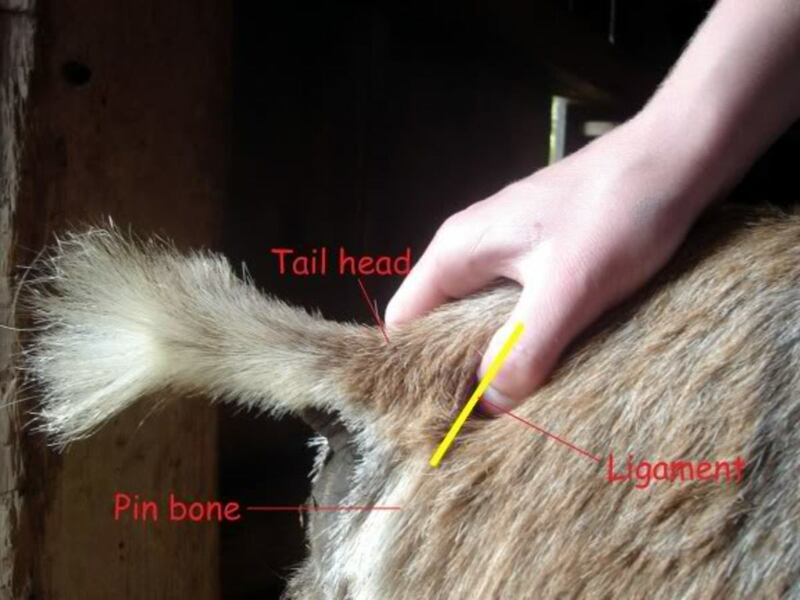 Your doe should have a strong level backbone and her withers should blend into the shoulder blades (no bumps or humps). Her front legs should be strong, straight and wide apart. Her back legs should be wide apart as well and her rear lines should be nearly perpendicular from hock to pastern. Your doe should walk gracefully. Her bones should be wide apart and flat and long. Pet several does and you will understand the difference in bone structure. The flatter the bone, the better the dairy animal. Check the doe's udder. It should be well-attached and your doe should have just two of them. The udders should not flop around so that it can get stepped on. Long udders with poor attachment are more prone to injury and disease. Look for udders with wide rear attachment, that are smooth and well-extended in the front. When the doe is milked out, the udder should be flat and empty looking. The more "meat in the udder", the less the milk capacity. We kept the three goats contently through the summer. Because Minion was content with her young companions and her young companions were content with her, we had no problems with the goats trying to go anywhere. They stayed within the couple of acres that we designated for their pasture area. I milked Minion every morning and every evening and then I would spend some time brushing the two younger goats so that I could handle them as they aged. My daughter and I enjoyed feeding them out of our hands. Both female goats went into heat and Billy the Buck serviced them. When we were certain that both does were pregnant, we sold Billy the Buck. The proceeds from Billy the Buck's sale went to feed and hay for the other two goats for the winter. So far the plan worked perfectly. The final part of the experiment was whether the does would have kids in the spring and how many. Minion was the first to give birth. Her firstborn was a doe kid. I could tell that she was still in labor and I saw three hooves in her birth canal, but there was no movement and one was smaller, so I washed my hands and put on gloves and gently moved the smaller hoof back into Minion. A large billy kid immediately emerged, but he was stillborn. As soon as he was born, a third tiny buck was born. Apparently that third hoof had been his. Both he and his big brother had tried to go through the birth canal at the same time, but it wasn't possible. If I had not manipulated the birth, I probably would have lost three goats (including Minion) instead of just one. The second doe birthed two kids as well, another buck and doe combination. Would I recommend this Method of Starting with Goats? The experiment did work. Getting one adult doe, a newly weaned doe, and a weaned buck definitely was a great way to start a dairy goat herd. I got three goats for less than the cost of two adult does, was able to get my female goats serviced without a lot of hassle or expense, and was able to use the money from the sale of the buck to pay for keeping the two does over the winter. I also got plenty of milk throughout the summer and fall months before I had to dry Minion off the last two months of her pregnancy. As I figured up the value of starting the way that I did, I was definitely money ahead. 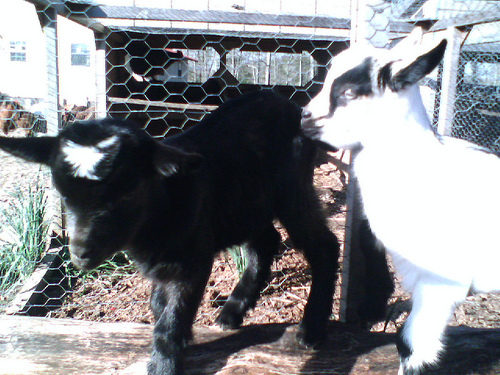 The experiment of starting a goat herd with one adult doe and two young kids was a success. Have you gotten any goats yet, Ann1A72? A well thought out plan, I should add! It was an interesting way to get started. I would definitely do it that way again if I were to start over. Interesting way to start a herd. I love goats, but have nowhere to keep them anymore. 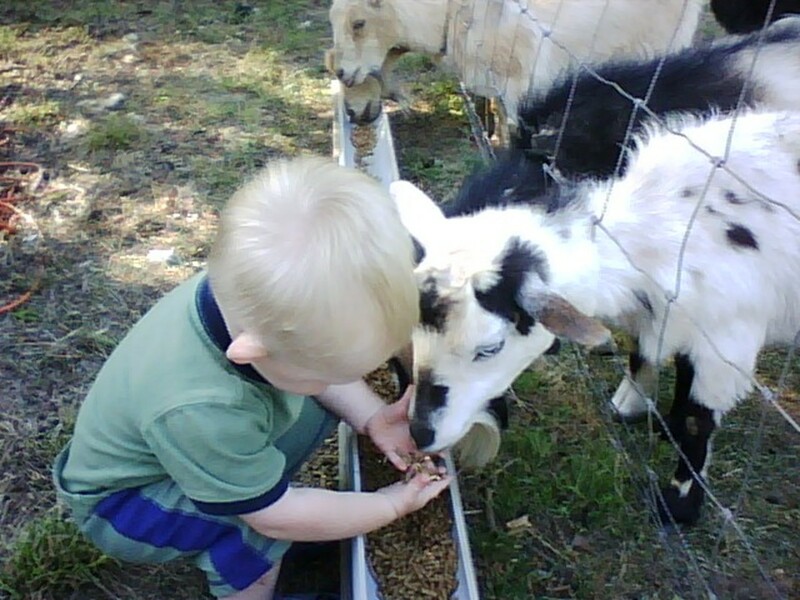 At one time when I lived on acreage, I had 8 head and sold a lot of goat milk, which I miss having myself. Good hub and voted up. You are welcome, teaches12345. I would say that your friends are interesting as well. Thanks for the comment! Have a wonderful day! I have friends who raise goats and they are quite interesting - the goats that is. I love goat cheese on my salads. 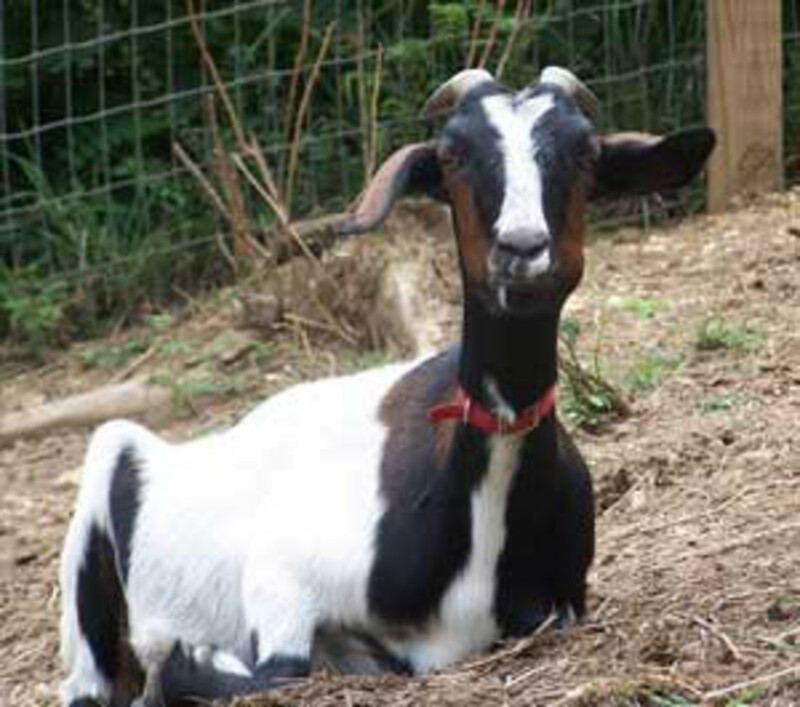 Thanks for the information on what to look for in raising goats. Hi billbuc, Thanks for the good word, I'll sure that you will write about your future goat acquisition too! I can't wait to read about it! LongTime Mother, I think goats are so much easier than cows. Getting kicked by a goat doesn't hurt as much as getting kicked by a cow! At one time, during another lifetime, we had as many as five goats. I love them...great pets and farm animals. In two years we will have some again. 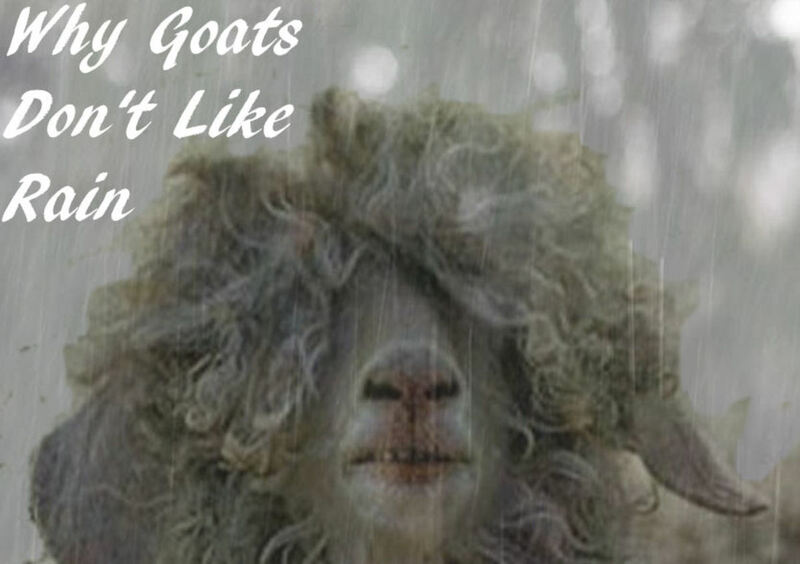 Great information here; a must read for anyone considering getting goats.